Candy, pumpkin carving, costumes…what’s not to love? I adore Halloween, and so my family and I have begun our decorating and costume planning. 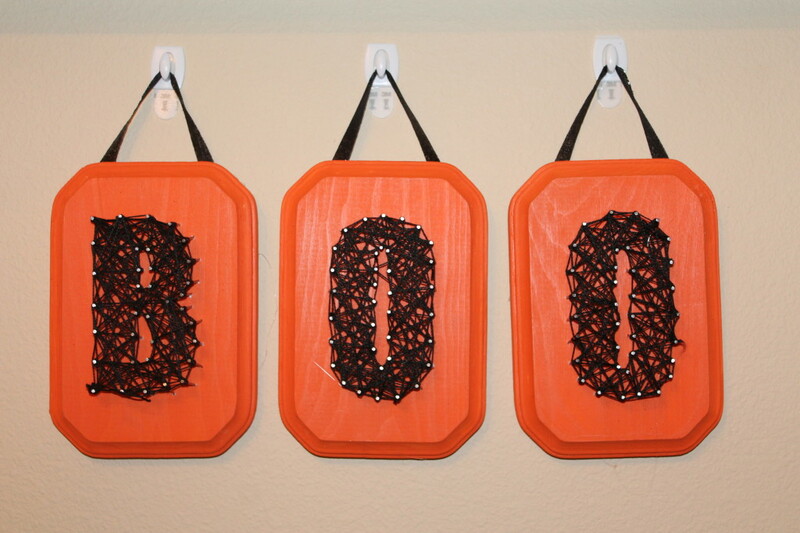 Pinterest has been taken over by string art, and it’s no surprise why. It’s a simple and inexpensive way to add some DIY art and texture to your home. 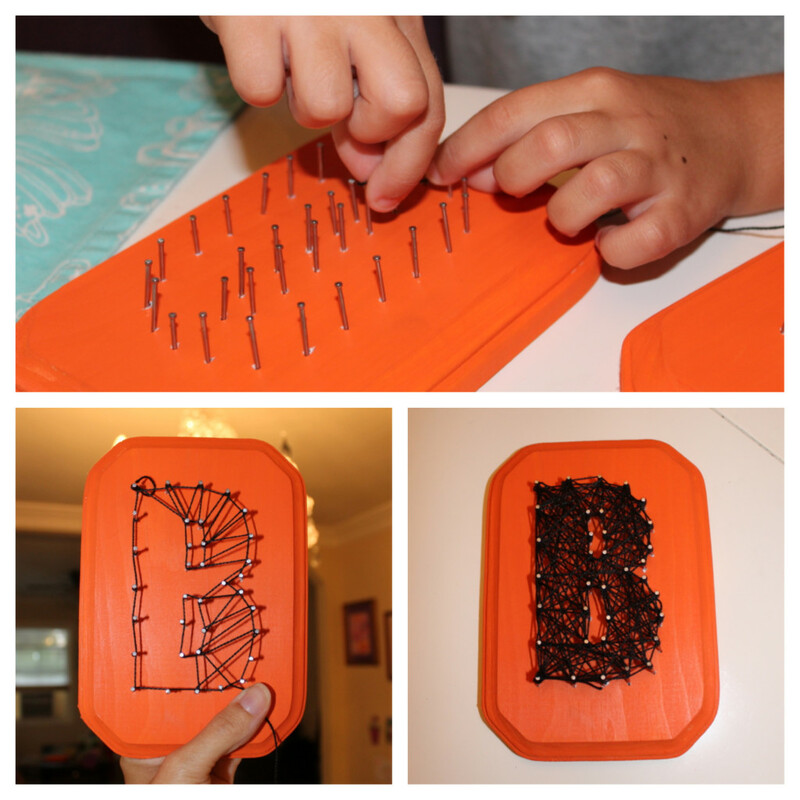 My girls have been so excited about the chance to help with this DIY Halloween String Art Project. 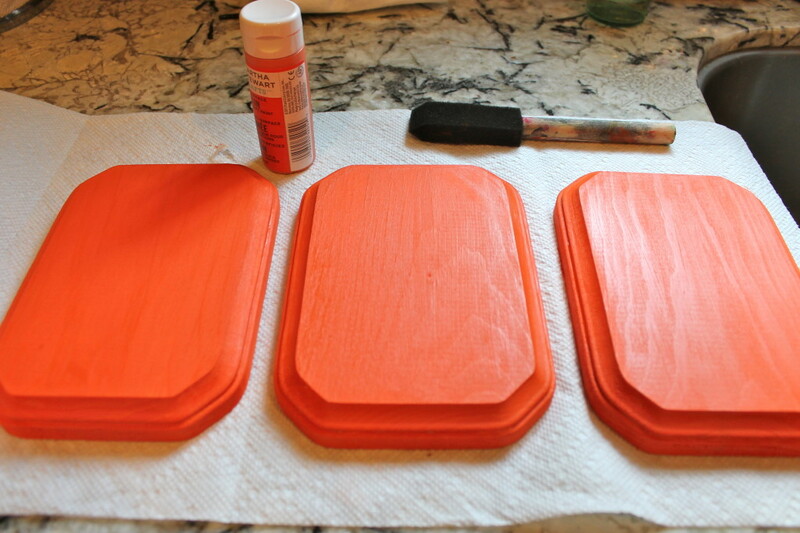 Step 1: Paint the wood and let it dry. 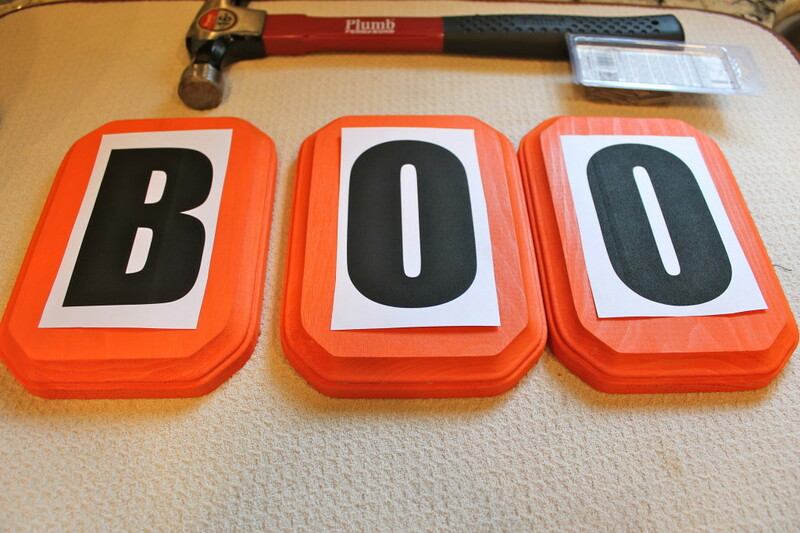 Step 2: To make my BOO template, I found a font I liked on my computer and printed out the letters. I trimmed the letters down a little, but didn’t waste time by cutting the letters out perfectly. 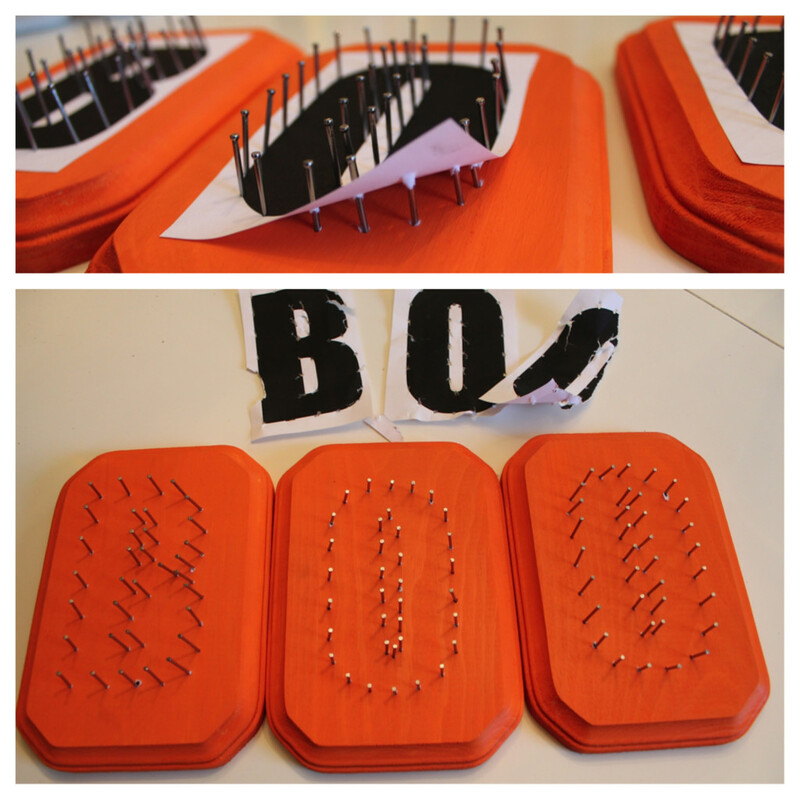 Step 3: Using the template as a guide, I hammered the nails to form the outside and inside of the letters. Work one section at a time for best access to middle areas. My helper handed me nails one at a time, but hammering should be done by adults. Just as a note: her hand was broken prior to this project. I promise it was not my poor carpentry skills. Step 4: Remove the template by carefully tearing away the paper. The nails should be pretty secure within the wood so I didn’t have to stress about pulling them out. Step 5: Starting stringing! This is where my girls took over. Being random is more challenging for me than it is for them, so it probably turned out better than I would have done myself! Keep an eye on younger string artists to ensure that they don’t cover the sections that should be left blank (like the inside of the O’s). Just unravel the string if a mistake was made or if you just don’t like the look of a section. Step 6: I wanted my art to hang on the wall, so I added glittery ribbon to the back of each. Then using 3M Command Hooks, I hung them on the wall. Holidays are a great time to let your creativity flow. Get out your needle and thread, duct tape, or bedazzler…and get ready to impress everyone, including Martha Stewart, with your Halloween creativity! How cute! You could do similar ones for so many different holidays, occasions or get togethers. Absolutely! Words are super simple so it’d be a snap to make something like “Thanks” for November. Oh that is so clever! And it looks fantastic! I bet you get a lot of compliments on those when people come to visit! So festive! My younger daughter brought one of the letters to school with her because she was so proud. Her teacher was very complimentary, but a little baffled at first! They definitely make more sense as a set. That is really cool, you can do this for so many different holidays with different words and colors. Love it! We love Halloween at our house, too! Your decorations are bootiful!!! How fun to have little hands involved…all the more enjoyable! Absolutely, Pam! They make marvelous assistants! Have fun! Depending on the age of your children, they might be able to complete more steps of the project themselves. Okay this is really cool, and so affordable to make. Probably cheaper then going out and buying the cheap premade stuff. The total project cost me less than $10, which includes the plaques, nails, string, and paint. I have a mixture of premade stuff and homemade in my house, but the homemade stuff is what makes our house feel festive. I love the creativity behind this, and it’s something I think I could do with the kids too. It makes such an adorable decoration. Enjoy it! My kids love admiring their projects, as I’m sure yours do. How cute! How long did it take to make them? It took about an hour total. Painting and stringing went pretty quickly, but the hammering was time-consuming. How cool is this!! What a great craft for Halloween. Melanie. This is great. I’m going to do with Ava and Chloe. If Chloe is struggling, try cutting out a spider shape or something else spooky from thick paper. Then punch holes along where you’d like her to string & she can lace it. Harper made a great outline for the letters, but needed guidance on going back and forth across nails. Love it! That is really unique and it looks like a web! That is super cute! I think I’d like to make something like that for Fall saying “thanks” or for Christmas saying “Merry”! Those are great ideas! Perhaps a Christmas tree too??? This is adorable and such a creative idea! I wonder if my daughter would like wrapping the string. I love how it looks like a spider web. I love that too! I added spiders to the top of mine a few days ago to make it even more spider-y. I just love this! It’s not only super cute, but looks fun to make. It is! The hammering became a little tedious, but then I got to sit on the couch with my kids to help with the stringing. That was the best part! This is a great craft idea and I especially like the fact that the project will last for years to come! It’s very durable. My nail heads were almost non-existent so I’ll have to be careful when packing it away to make sure the string doesn’t slip off. This is so cool! I just love how easy it is too! That is adorable! I love that it is Halloween craft time!! Me too! And I’m loving that it’s candy corn time! Those are cute. You could do that with NOEL at Christmas, too. The possibilities are endless! NOEL would be adorable. I could fill my house with them…JOY, HOPE, etc. That is really cute! It’s different then others I’ve seen too!! That is so cute and look so easy to do. That’s really cool! I love it! Love this! Looks super easy! OMGosh! That’s so freaking cool and I bet my kids would love to make something like this for Halloween! That is SUCH a cute idea! I don’t trust myself with a hammer but I may enlist hubby’s help & try this out! The string art is pretty forgiving. Very few of my nails were nailed perfectly straight. But grab the hubby anyway; a family project makes it even more fun! So cute! I may have to try this! That’s a very cute and fun idea for halloween! 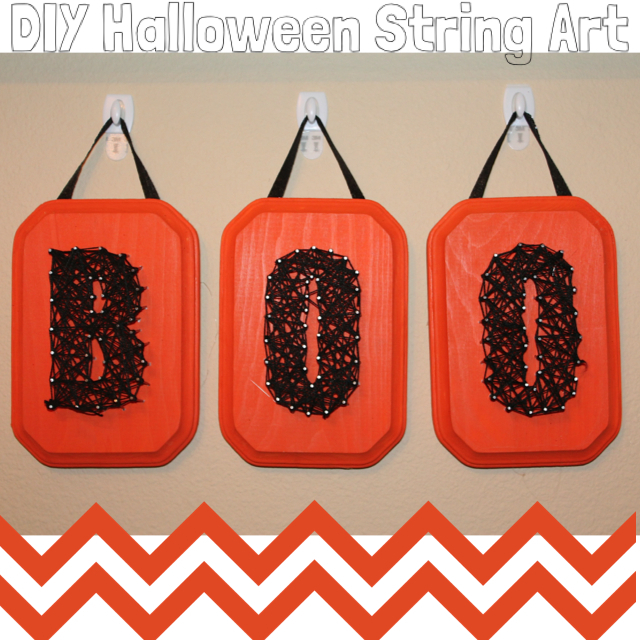 This project is so cute and looks easy to do! I can see this hanging in my front entrance as we speak. Can’t wait to try it out! 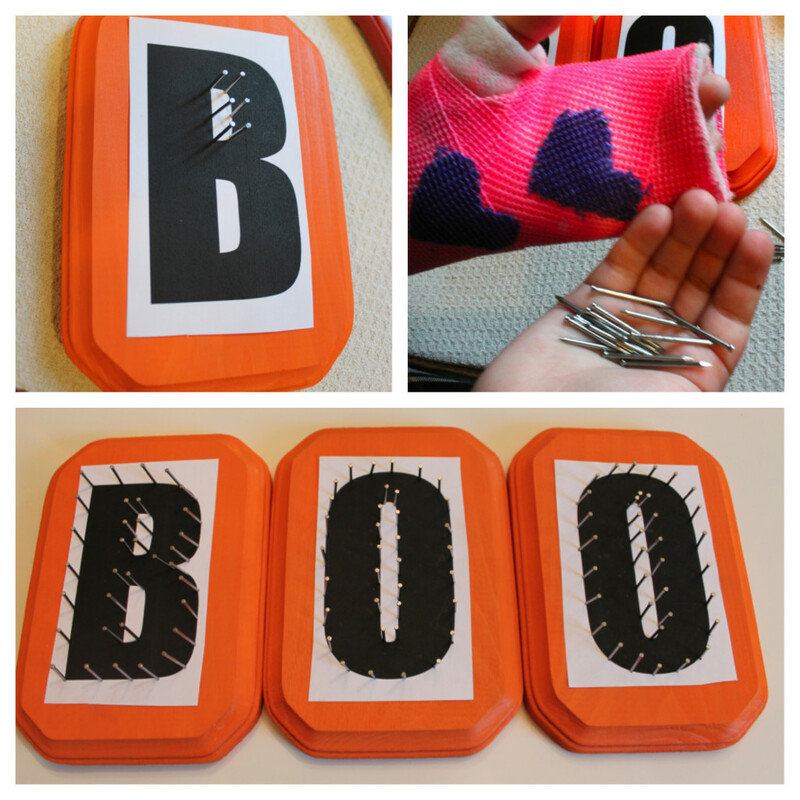 What a cute craft idea for Halloween! These are awesome!!! i want to do this with my little ones! Oh, my goodness — that is absolutely adorable!!!!! That is so neat! My kids love doing stuff like that! This is incredibly creative, I love it. Oh I love these! You are so very talented. This looks really fun – I just might have to made these! I love these! Such an affordable craft with a big BANG.